Tuesday October 23rd 1923 I sewed all day on my dress. Ott and Roy here for supper. Tishie went with me in the evening to hear "May Robson" in "Rejuvenation of Aunt Mary." It was splendid. Very pleasant weather. Wednesday October 24th 1923 I finished my dress today and did some other things. The folks got back from Des Moines at supper time. I crotcheted in evening. Thursday October 25th 1923 I washed curtains and did cleaning. Hattie went to a church supper. Rob home this morning. Hattie had a boy at work in the cellar. Friday October 26th 1923 I washed windows and put up curtains and doing other things till after three oclock. Hattie had a boy working part of afternoon. LeGrand took Hattie and me to Mrs McBrides to a party. I got my new hat. Ron brought us home. Evening at Otts. Saturday October 27th 1923 I was busy about my own affairs all AM. I rode to town with Rob after dinner and did some errands. I went to the cemetery to get a little plant on Wills grave. The evening at home. Sent record to W B Mc----. 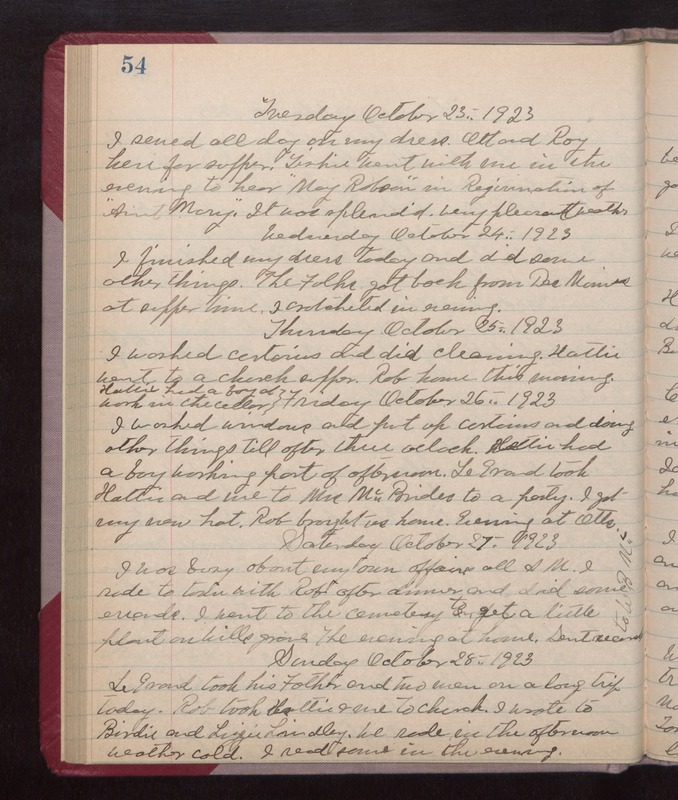 Sunday October 28th 1923 LeGrand took his Father and two men on a long trip today. Rob took Hattie & me to church. I wrote to Birdie and Lizzie Lindley. We rode in the afternoon. weather cold. I read some in the evening.